In a moment of woeful irony in the Obama-administration documentary The Final Year, UN Ambassador Samantha Power travels to Cameroon to offer photo-op comfort to families terrorized by Boko Haram  only to have her motorcade kill a 7-year-old boy. Greg Barker, director of this fan film, does his best to downplay the accident: It is discussed while we watch a clip of Powers convoy moving at a crawl when in fact it was reportedly traveling at over 60 miles an hour when it struck the boy. Despite Barkers intentions, the handiwork of the Road to Hell Paving Co. is obvious. Team Obama, with its lets-hug-it-out attitude to world conflict, left a bloody trail. The Final Year, playing on a few screens ahead of its debut on HBO, drew notice for a scene in Powers apartment on Election Night 2016. She invited the camera crew to film her party with the worlds 37 female ambassadors to toast the inevitable Hillary Clinton landslide. Powers fist-pumping as she watches the election returns turns to blanching, but its Deputy National Security Adviser Ben Rhodes who has the most amusing reaction to Donald Trumps victory. The Final Year is chiefly a study of Obama-administration foreign policy as overseen by John Kerry, Power and Rhodes. The foreign-policy masters see their three accomplishments as the Paris Climate Accord, the opening to Cuba and the Iran deal. its Deputy National Security Adviser Ben Rhodes who has the most amusing reaction to Donald Trumps victory. Asked whether a Trump administration might endanger his accomplishments, he says, Ive never really considered that. So what does the speechwriter and former aspiring novelist have to say when Trump wins? I mean, uh, I cant eits Deputy National Security Adviser Ben Rhodes who has the most amusing reaction to Donald Trumps victory. Passing all Obies major FP missteps to niavety, is indeed niave. Passing all Obies major FP missteps to naivety, is indeed naive. Naivety? It looked a lot more like depravity to me. These guys are/were far from naive. Every bit of destruction that was caused was deliberate. The only regret they have is not wreaking more havoc on our country. These are now endangered, but I hope to see them put on the extinction list. BTW, the Eastern Cougar has been declared extinct so now the econuts can bring in western cougars. But what happened at Hillary’s HQ on Election Night? People were there .... people know but aren’t talking ... why? Someone needs to get a clip of that and put it on Youtube. Naivety is British spelling for naiveté. Interesting, since I assume the word is French. the combination of cynicism towards society and naiveté towards government actually defines socialism (of any stripe). Obama’s foreign policy was not rooted in naïvety. It was rooted in a bizarre leftist belief that showing weakness to a belligerent enemy will somehow convince him that you are no threat, and he will stop being belligerent as a result. Those pushing such policies seem blind to the fact that this kind of policy only leads to more belligerence (especially when the policy has been coupled with massive payoffs). I am thrilled that President Trump understands the real consequences of these policies and is acting to cut off the funding. Displays of belligerence should never be rewarded with massive payoffs. What would the world look like now, if our policies for the last several decades had been focused on rewarding countries for advancing human rights and prosperity, instead of paying off belligerent dictators? Better choice of words. Well done. He lies even when he doesn’t have to. Would love to see that and Power’s shock. 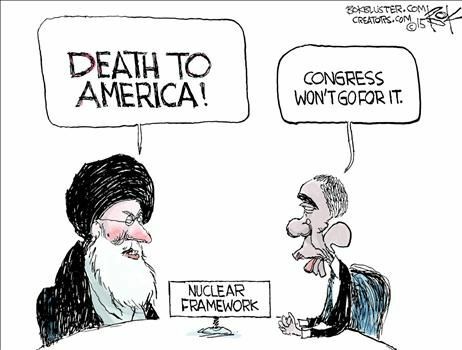 Paris, Cuba and Iran are Obama’s biggest failures, hands down. This kind of Doublethink would give Orwell the dry heaves. "He lies even when he doesnt have to." I knew a kid in school that would lie about everything, even to telling you the wrong time of day to avoid the truth. I guess he missed real possibilities by not going into politics (or maybe he did and is lying about his name). AND there was a cabal of thousands who helped him sell all of his lies to the American people.